New for 2012! 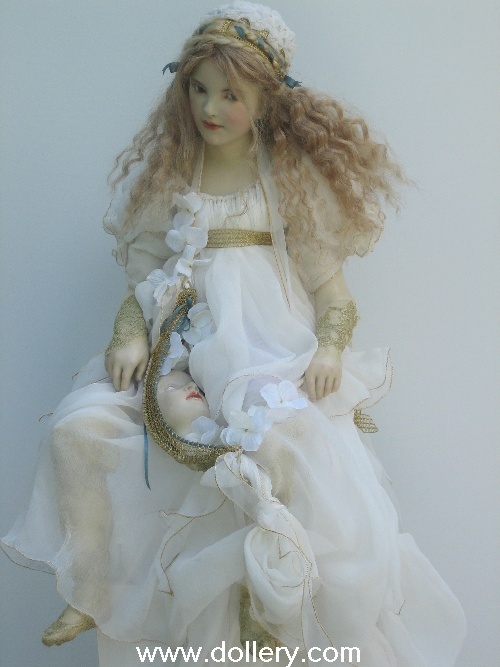 We are pleased to show you the latest two new works of art Hanna created for our most recent show this past October. WE have just moved them to this page from our last online show page! 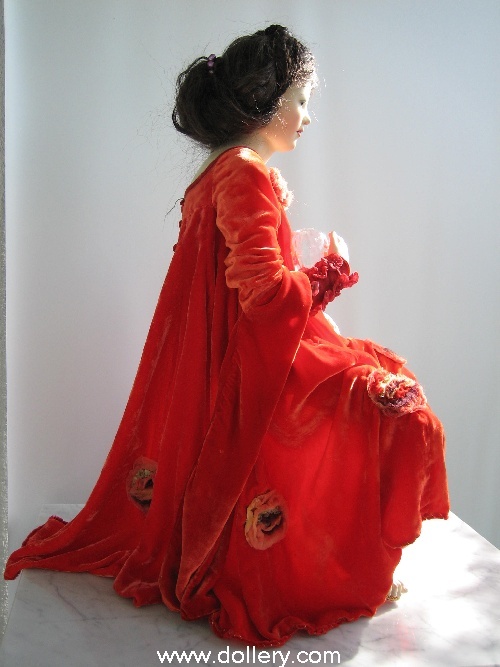 "Little Red" and "Princess and the Pea" are both exceptional works of art by Hanna. These are the first two storybook dolls Hanna has ever created! We are honored to present them to you. We have been blessed to have Hanna attend our annual 2006 show personally and participate in many, many of our recent shows. Recently (in Jan. 2012) she has just broken her arm. We wish her many prayers to recover quickly! 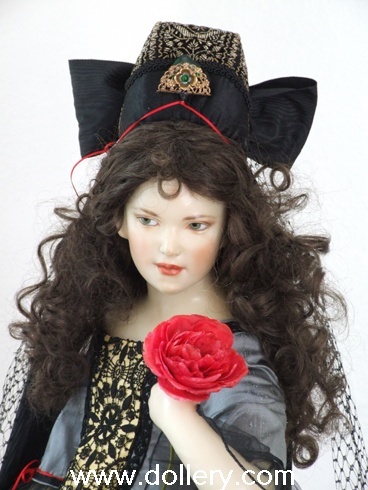 We are awaiting custom orders for June/July but hope to have more work for our 30th Anniversary doll show in October of 2012 from Hanna. We wish her a very speedy recovery! 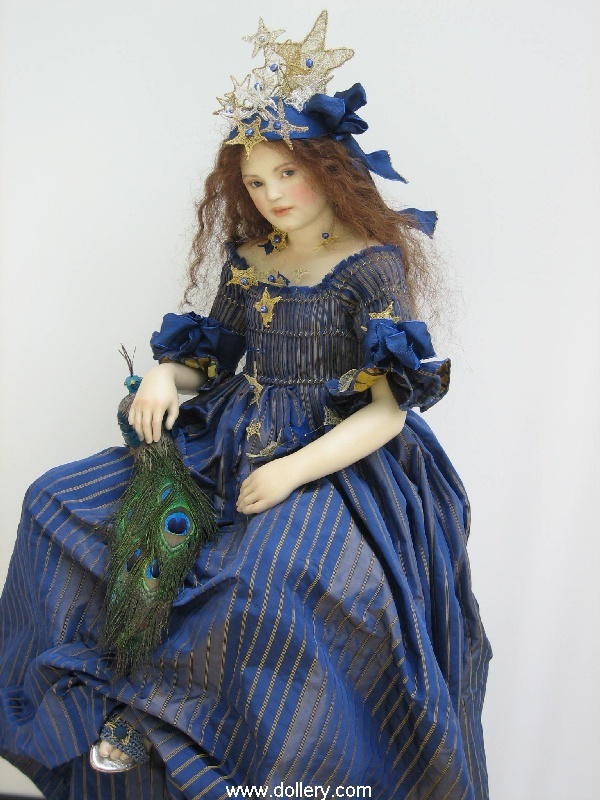 Be sure to contact kmalone@dollery.com to get on our mailing list for updates of her new ooak work. 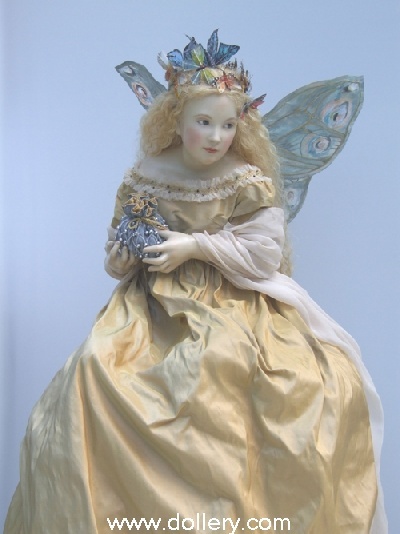 Fairies - We have had an exclusive on Hanna's fairies so if you are interested in doing a custom order be sure to contact us! Hanna has created many theme pieces throughout the years for us. 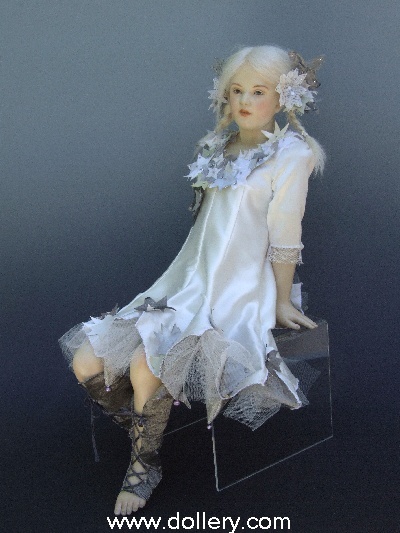 Be sure to view all the work below to get an idea of her stunning pieces. Hanna prefers to work in the "abstract" and gives very careful thought and consideration into all her props and accessories. Be sure to read her bio here. - Hanna Goetz's Biography. 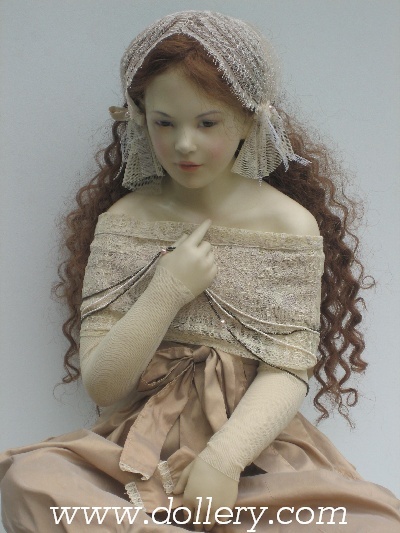 Note - if you love a doll by Hanna inquire w/ kmalone@dollery.com about the possibility of doing a custom order for a similar themed piece. 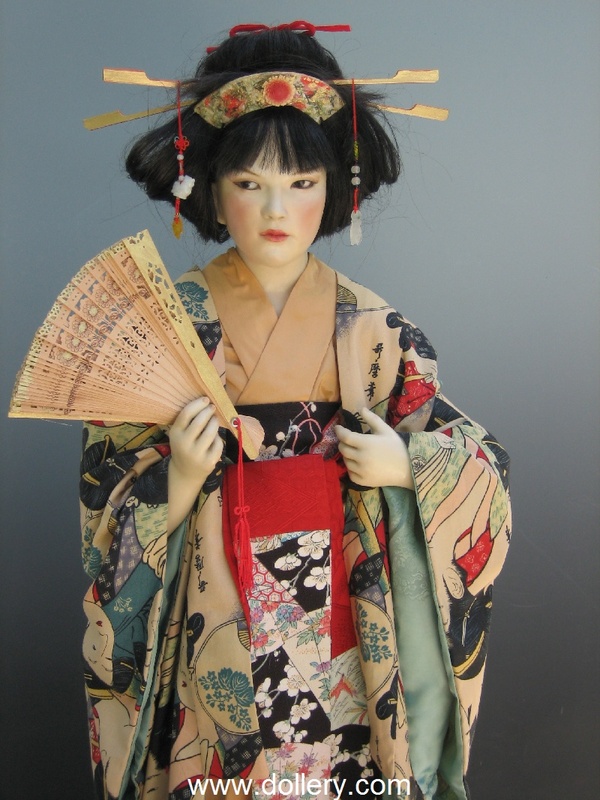 Keep in mind each has to be a ooak must be unique in order to keep the authenticity of the ooak work; however, similar themes and feels can be created. We would be booking at this point into the fall 2012 year. Hanna Goetz at the Dollery our 2006 Doll Show! 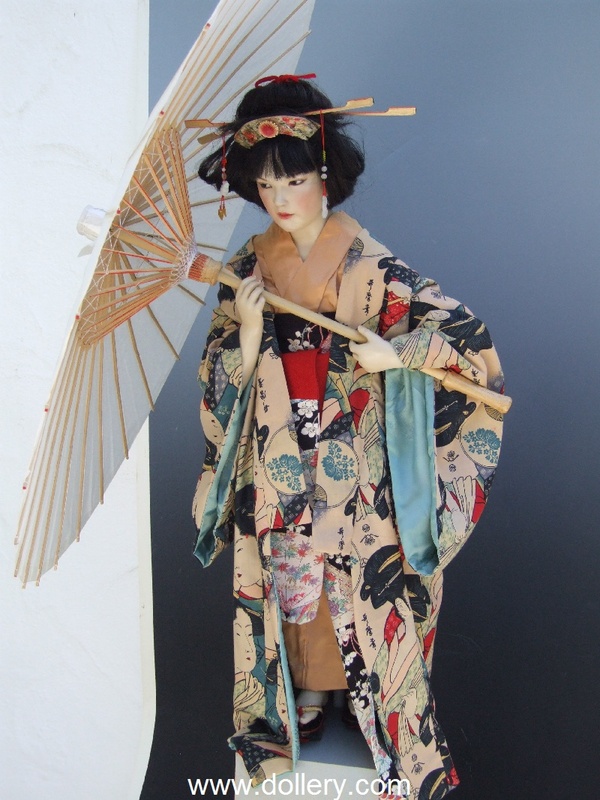 Japanese Girl "Against the Storm"
Kimono . Cotton special design out of Alexander Henry Collection , lining with woven Japanese symbols. 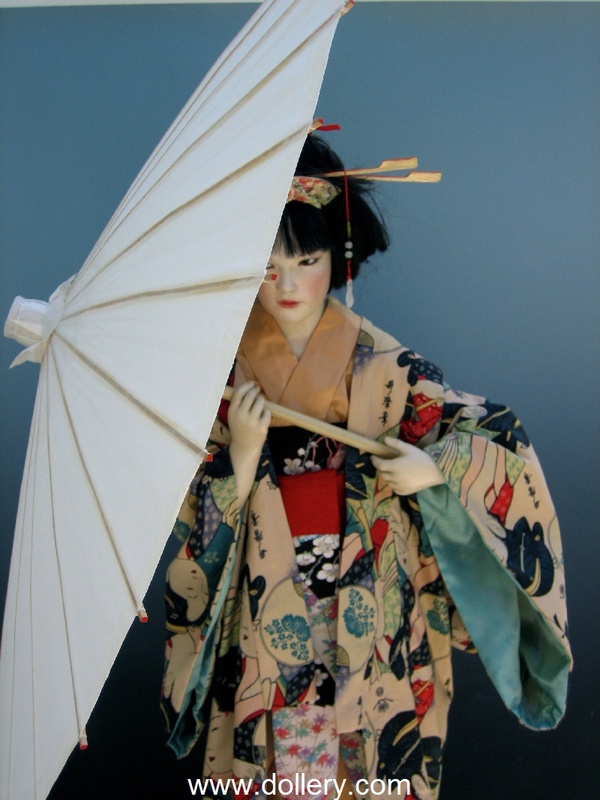 The figure can be presentated with a fan out of wood or with a paper umbrella, (Pergament) both partly handpainted in Gold and Red. Shoes are very rare .They are out of painted wood, originally in black and red and called Gaetas.On the surface are two dragonflies. 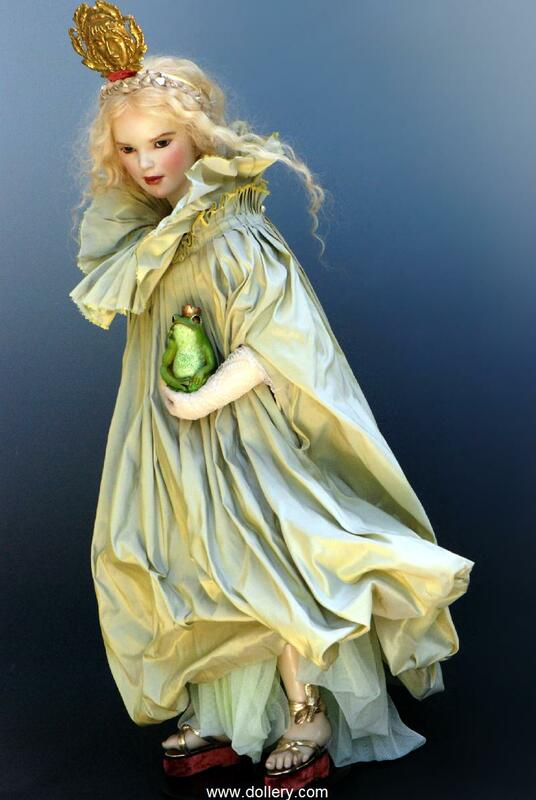 “The Frog Princess” is dressed in a warm yellow & light green double woven silk with a touch of grey in it & metallic threads. Her underwear is partly silk chiffon and partly synthetic tulle with the finest French lace. We just love her shoes made of leather and velvet. 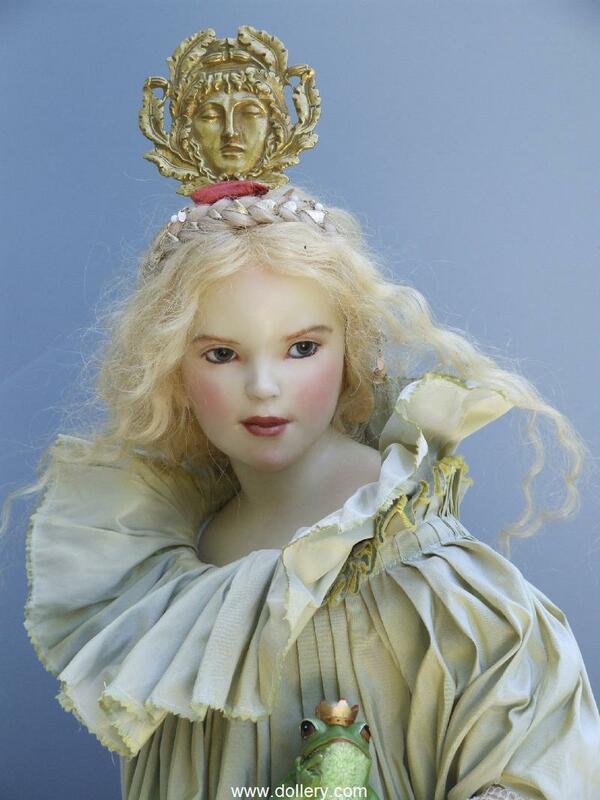 Her head decoration is made of French bronze. 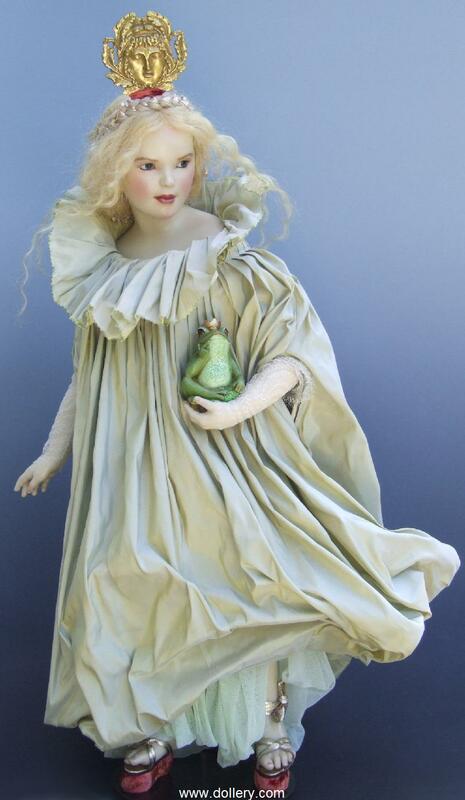 Hanna said she created it in order to point out the future change of the shape of the frog into the beautiful young man which he already is in the subconscious mind of the young princess. The movement and the shape of the cloth are designed to symbolize the forthcoming process of the change. She is truly magical. Hurry! 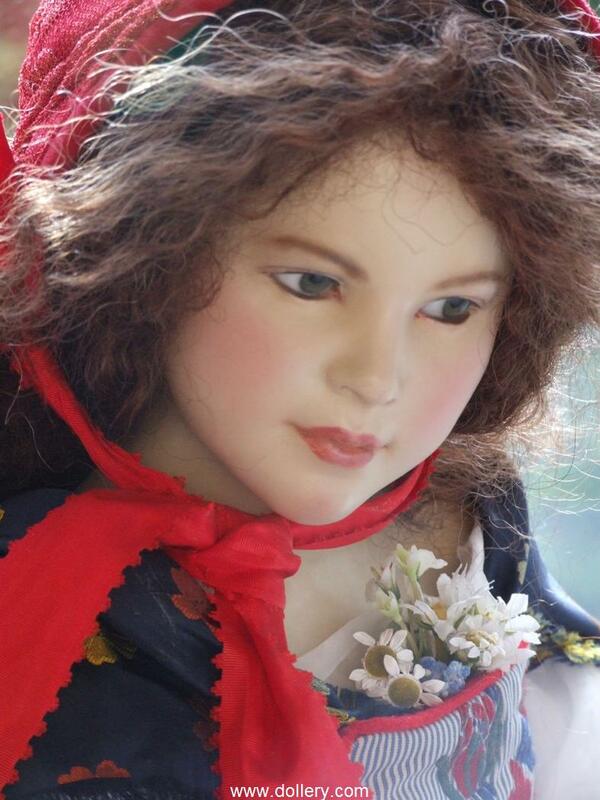 Click here for a video about this doll! Here is a video focusing on the back of the doll! This piece is really unique. 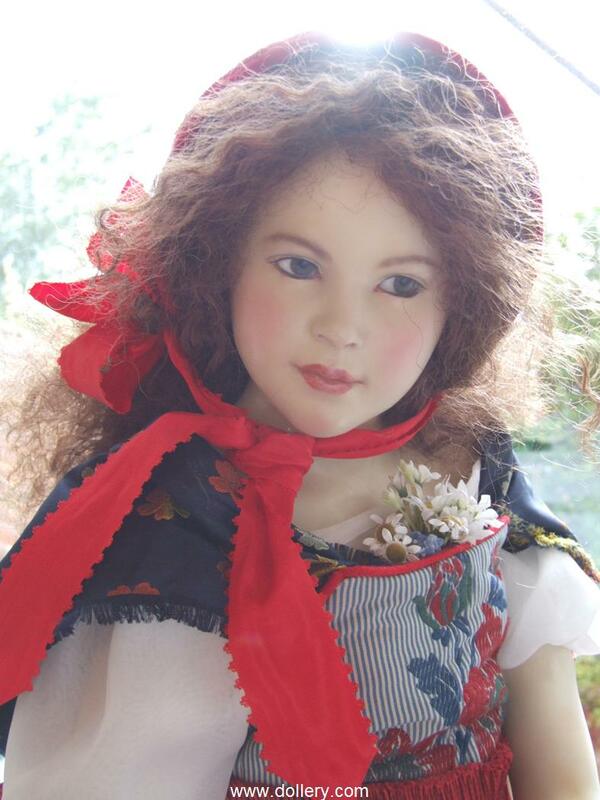 She is Hanna’s very first storybook doll ever. 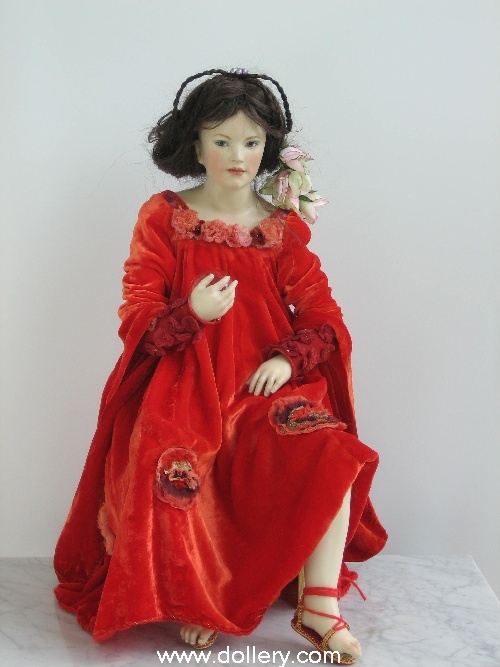 “Little Red” is dressed in very traditional costuming for Hanna. She is just beautiful and different. 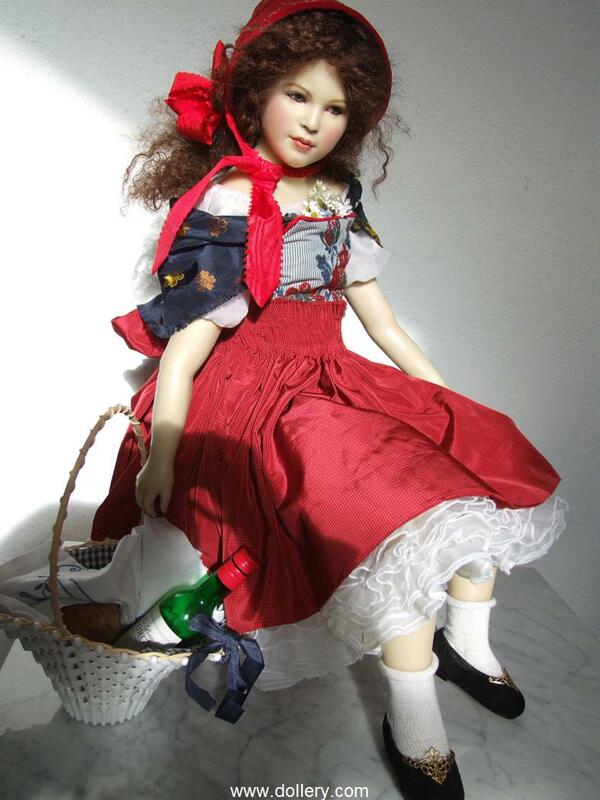 We love her interpretation of “Little Red Riding Hood” and the addition of a wine bottle! 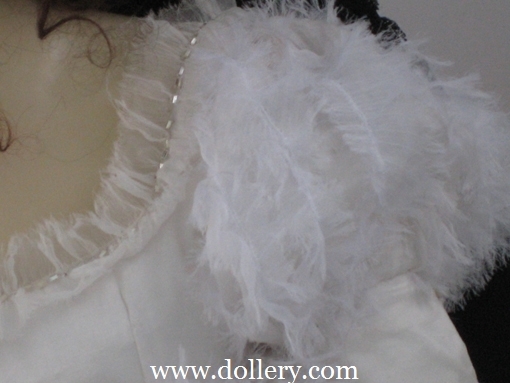 The blouse and slip have a double layer of silk organza. Note the heavily embroidered silk necktie! The bodice is made out of embroidered linen. 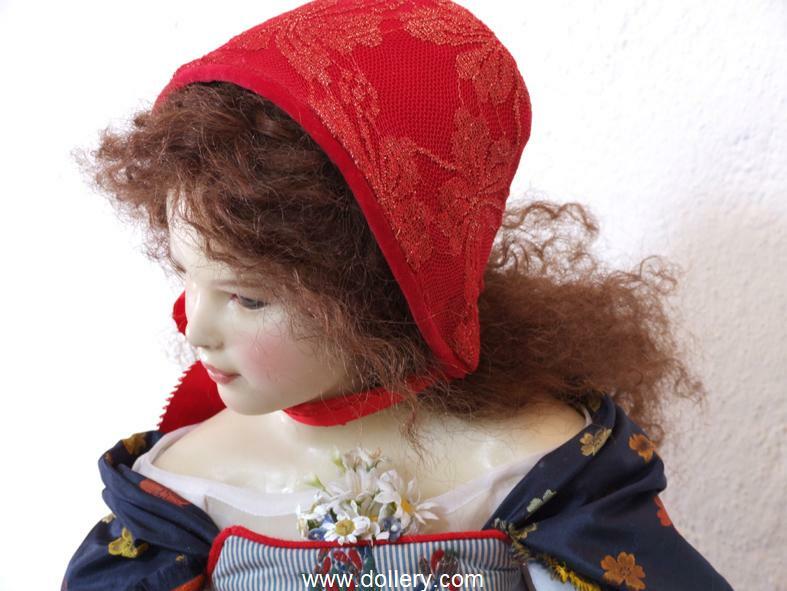 Her cap is red velvet covered with tulle and golden blossoms. The ribbon is made of a special woven silk. Her shoes are made of leather & metal. The socks are hand knitted out of silk from Germany. Everything is done by Hanna herself. 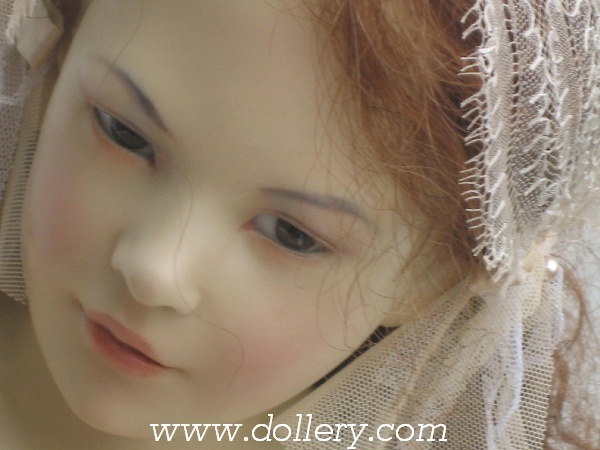 Click here to watch another video about this doll! German mouth blown green glass eyes. 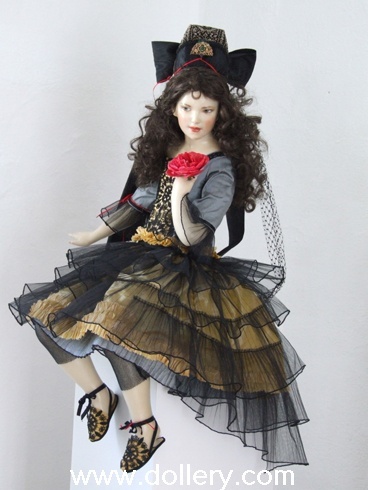 She is adorned in a beautiful handmade dress made of black antique hand woven lace underlayed with gray silk. 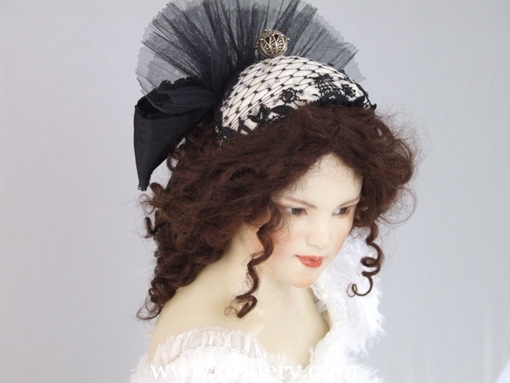 She wears a beautiful rare handmade antique hat which is adorned with silver beads, black antique grained ribbon and a special brass hat broach. 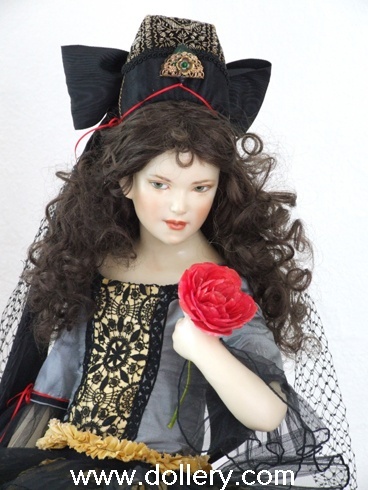 Mohair wig, dark brown ,German mouthblown eyes, : handmade calf leather boots with elastic tulle insert. clothing: top double layed silk with silk chiffon braid hand embroidered with long pearls . Lower part is silk chiffon with a handmade blossom , cape and sleeves out of silk with torn strips of silk chiffon. 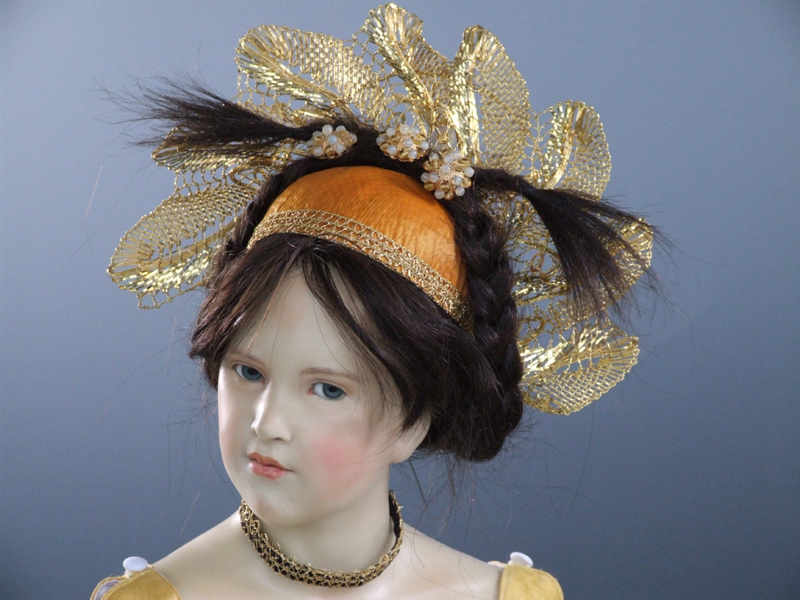 Antique hat with, handmade and covered with velvet ,with crystals hand embroidery. The ribbon is made out of taft silk special made for costume. Made of high-fired clay with wax. The bodies have a strong moveable skeleton with soft stuffing body. 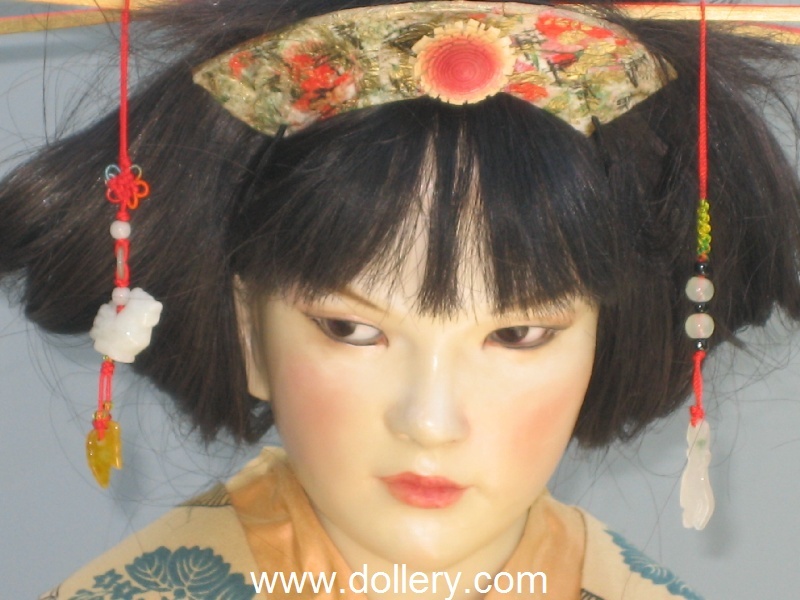 Both have hand knotted European human hair and mouth blown glass eyes. 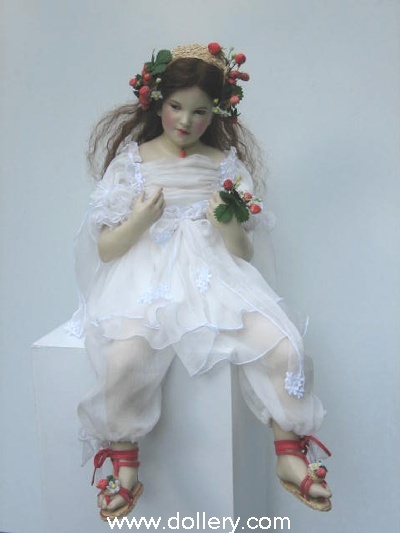 Hanna starts with a sketch and then creates a wire armature for the intended position of her dolls. Small bits of clay are attached and as the clay hardens, finer surface details of the head, breast plate and limbs find their definition. After 2 firings pieces are then dipped in wax, painted, and then dipped again. Hanna did all the embroidery on this silk velvet herself. She also made the decorative blossoms. 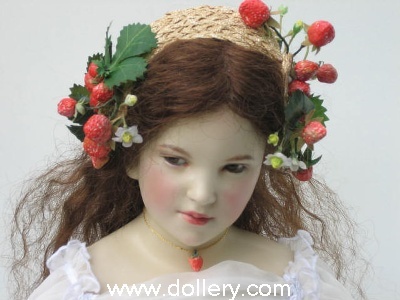 Strawberry Girl's dress is made of silk chiffon and beautiful lace. 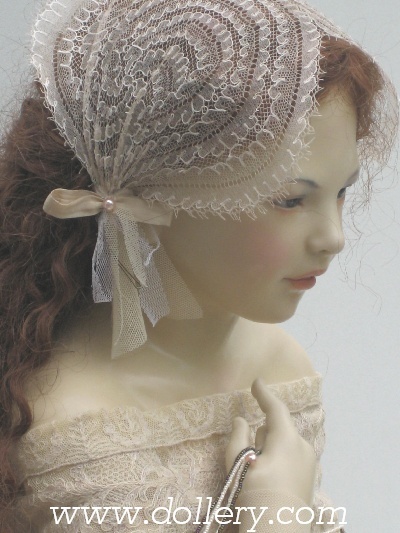 The head piece is hand created from small thatched ribbons. 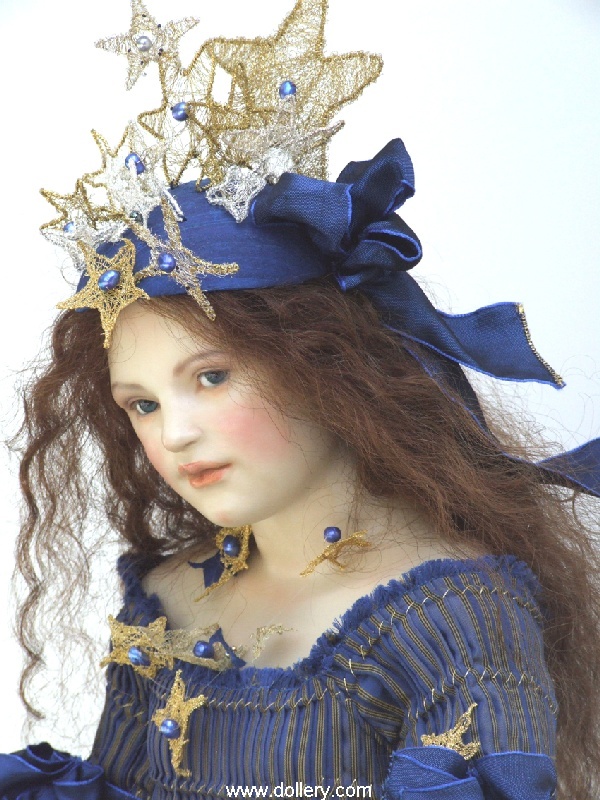 The shoes are designed especially for this piece out of ribbons like the head decoration. Each strawberry was hand crafted by Hanna especially for this piece. One of a Kind. High fired clay with wax body. Strong moveable skeleton with soft stuffing body. Blue mouth blown glass eyes, reddish/brown hand knotted European human hair. 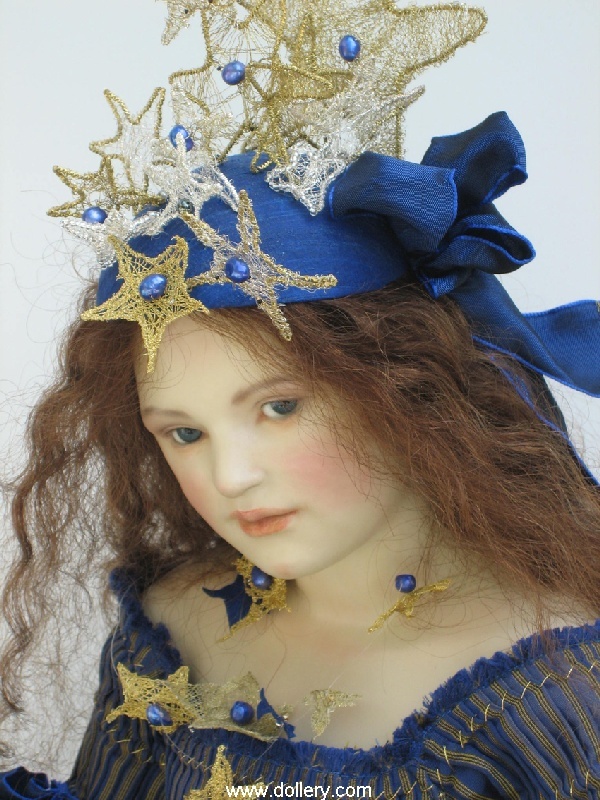 28" seated including stars on hat. Eyes are grey blue German mouth blown crystal eyes. Dress: double layers of heavy silk with handmade embroidery with gold threads and Swarovski crystal glass pearls. 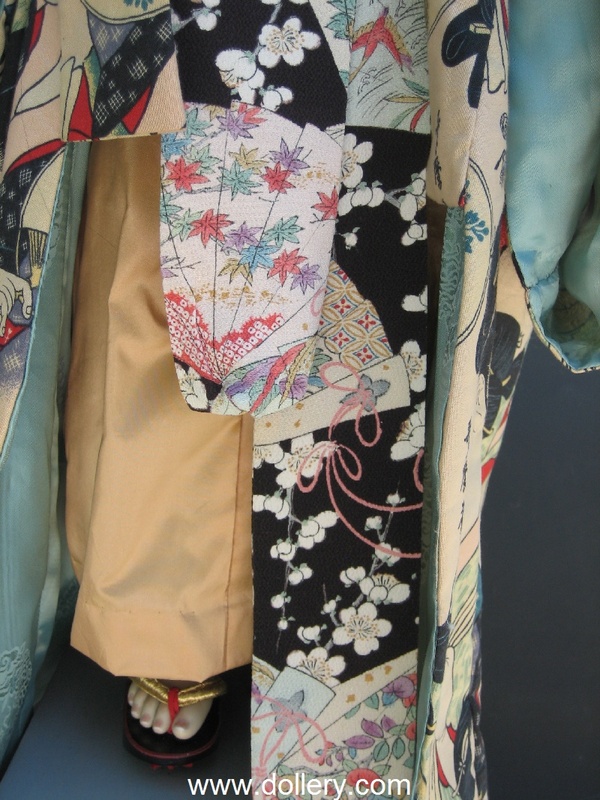 The stole is hand colored silk chiffon with gold embroidered seam. The shoes: sandals handmade -gold and beige leather with small gold ribbons. Outfit: the dress is star shaped. The seam forms the corner of the star. The bags from the edges of the star are destined to act as collectors for the star. The color , mainly white and silver, echo the fading light of the stars , the Swarovsky crystals the sparkle as well. 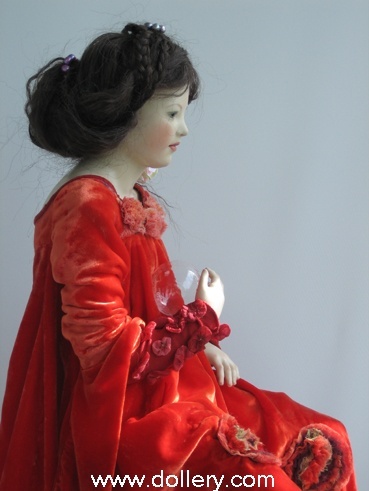 The dress is made of silk satin. The stars are made of different textile textures and vary in different shadings. The silver fabric, also used for the boots, is a special metallic fabric. Some of the picked stars are worn around the neck as a necklace. 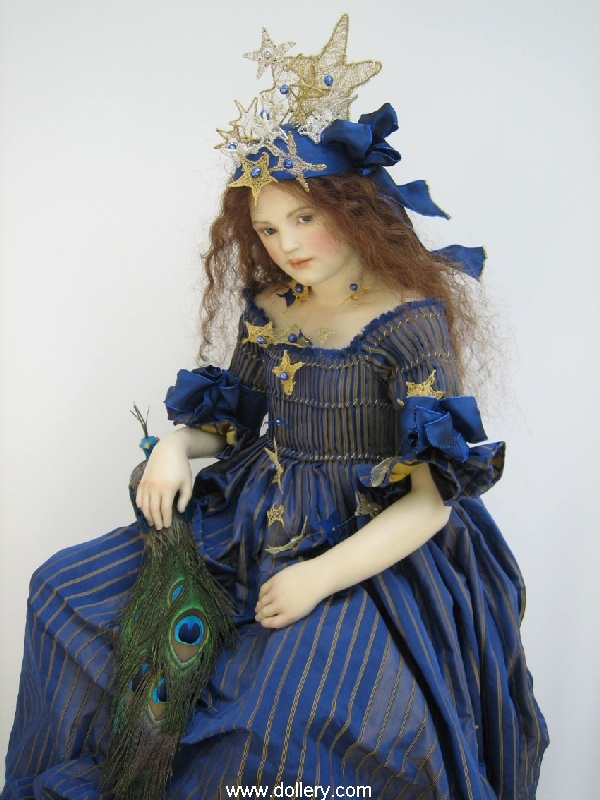 It is made from different fabrics and assembled in a patchwork technique, stringed by honed pearls and Swarovsky crystals. 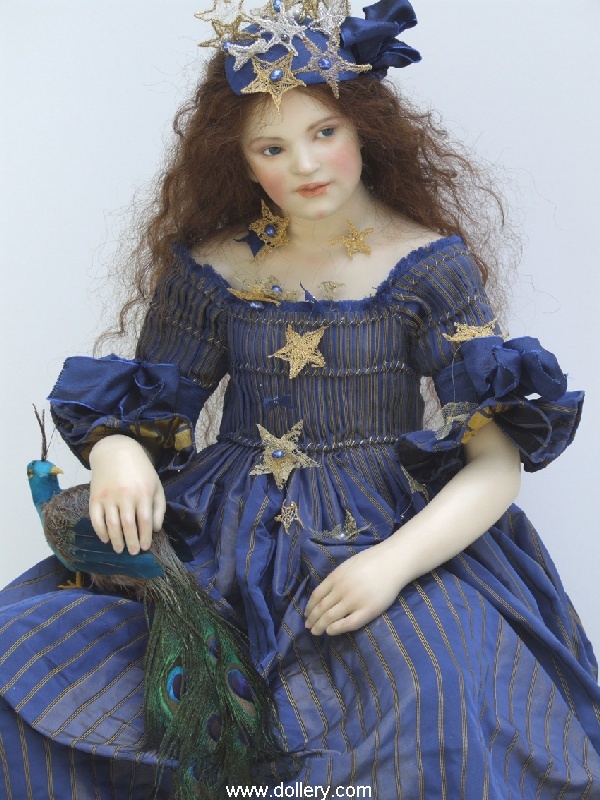 The star on the dolls chest with the red crystal is her special star. 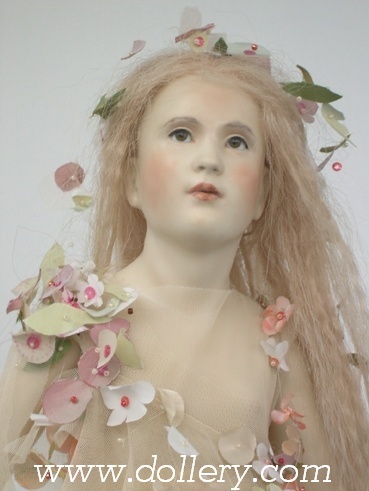 Summer, Show Priced at $5,600 SOLD - Love her? 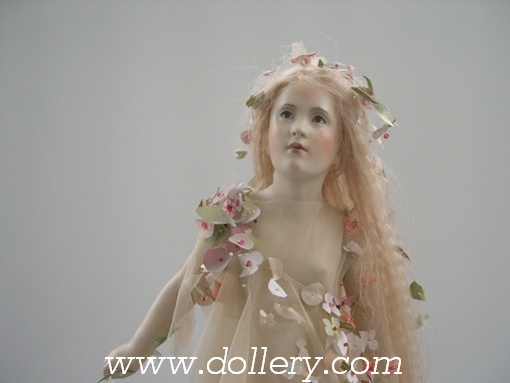 Wish you got her - contact kmalone@dollery.com about doing custom orders similar but never exact. 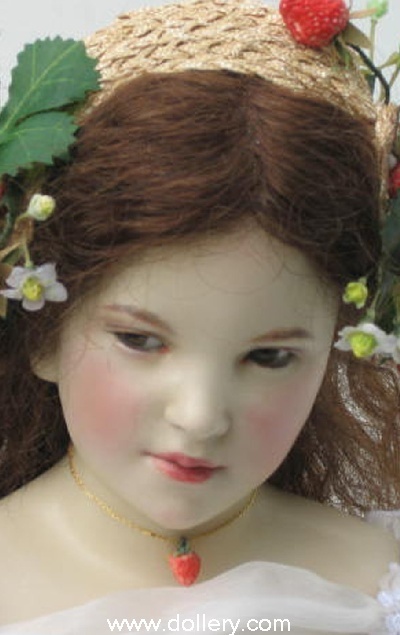 One of a Kind, 27 1/2", Green German mouthblown glass eyes, Hand knotted wig on a special thin tull. The cherries are hand made by Hanna herself. 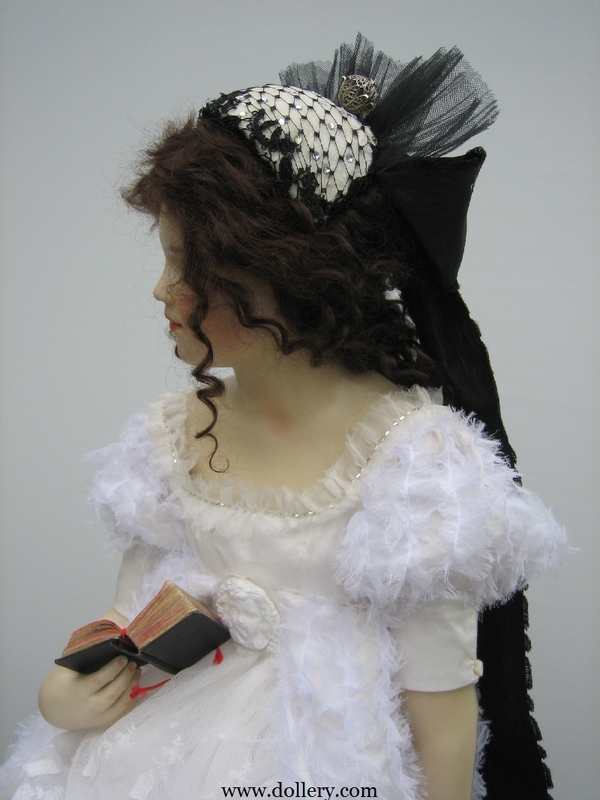 The outfit is Swiss bastist, embroidered, English lace and tull. Shoes are crocheted by Hanna. 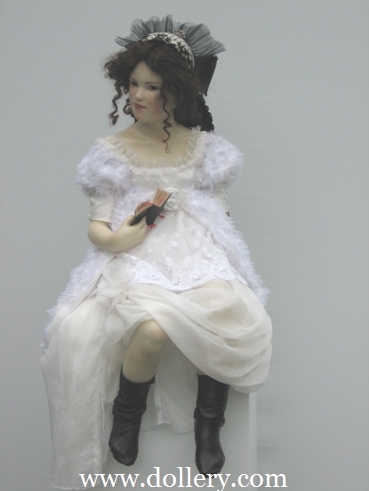 She sits on an acrylic bench with a white cover made out of the highest quality tissue. 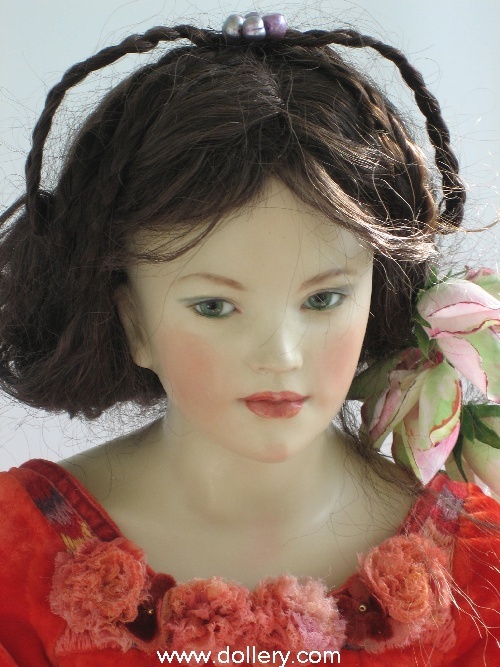 One of a Kind, 16" seated, High Fired Clay with Wax, dark brown German mouth blown glass eyes, dark brown human hair. 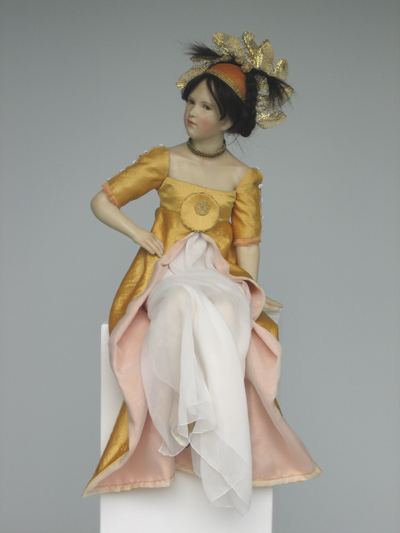 One of a Kind, 23", Standing, high-fired clay with wax body. 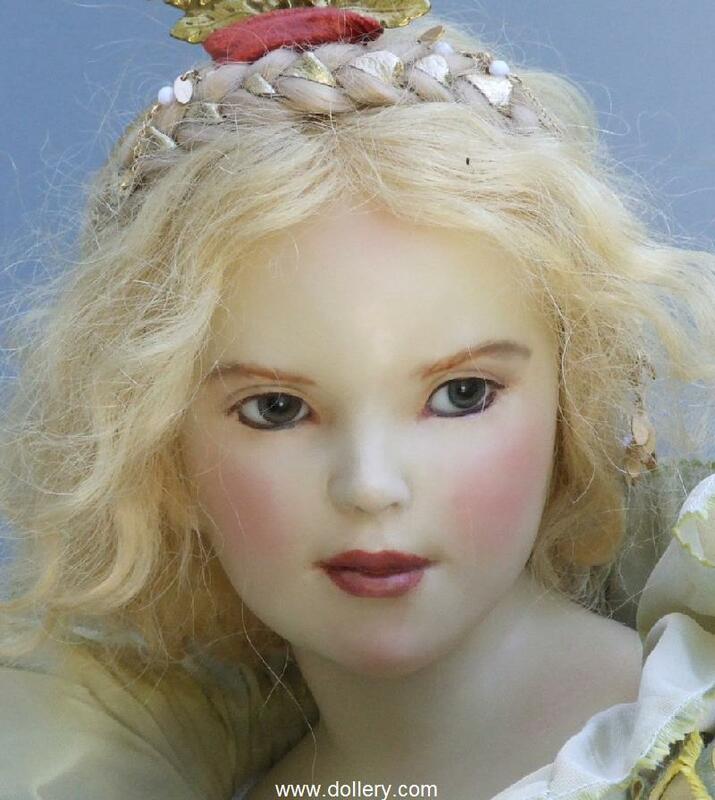 Middle is partly fabric arms partially moveable brownish/green German mouth blown glass eyes. 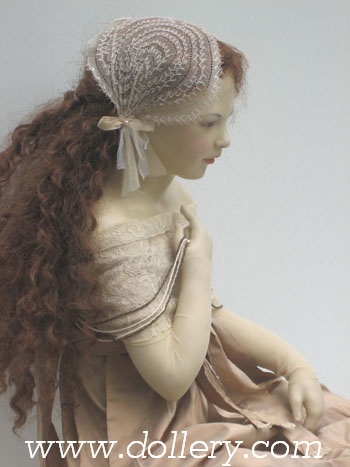 Hand knotted blond human hair wig. One of a Kind. 20" Seated on chair. High fired clay with wax. Blue German mouth blown glass eyes. Hand Knotted blonde mohair body. Two piece model with short stuffed middle. Painted chair included. One of a Kind. 27" Seated. High fired clay with wax. 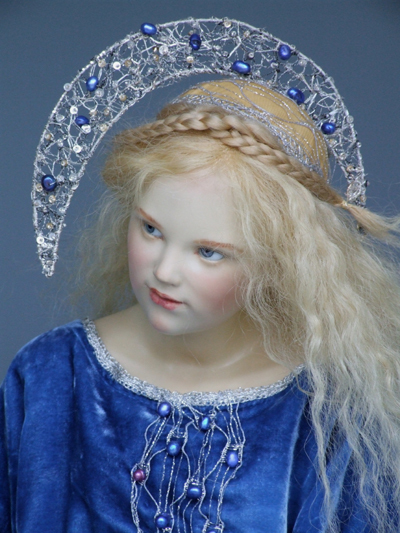 Blue glass eyes, Blond human hair plaits. Body stuffed with moveable skeleton. $4,000 One of a Kind, Strawberry Blond hair, 21"
Winter - O/K - SOLD - HANNA DID THE THIRD IN THE FOUR SEASONS COLLECTION FOR OUR 2005 SHOW. 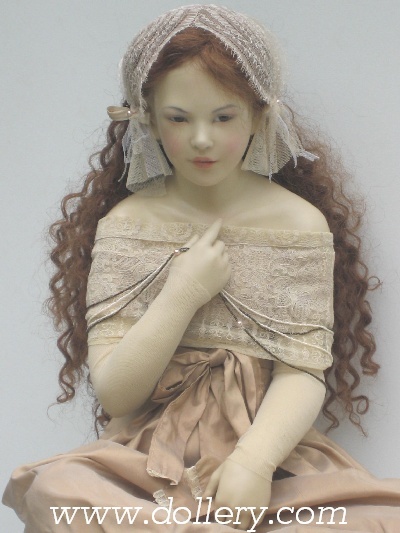 BE SURE TO EMAIL KMALONE@DOLLERY.COM FOR A FREE 2006 SHOW CATALOGUE HIGHLIGHTING HANNA'S WORK AND TO BE ADDED TO OUR MAILING LIST FOR HER WORK AS IT IS VERY DIFFICULT TO FIND. High fired clay with wax. 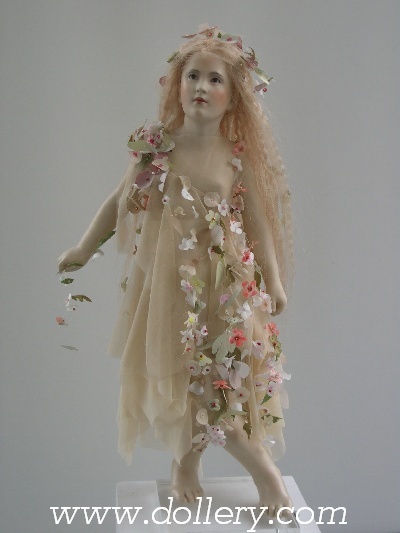 Spring is the first one of four projected Four Season dolls being created by Hanna. 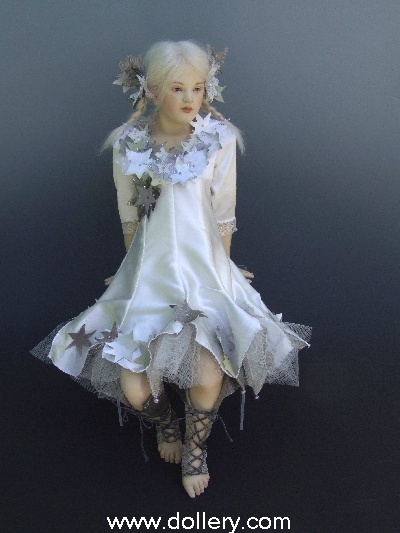 The dress is hand painted double woven white silk with a thin wire to create the blossoms. Her top is appliqued with double woven silk leaves on stretch tulle. The leaves are in several forms in order to emphasize the diagonal lines of the composition. The tulips and leaves are handmade and painted by Hanna. Every detail is done by the artist.